Wind is now producing 5.5 percent of the U.S. electricity supply—with signs of stable industry growth and improved fundamentals. The U.S. wind industry installed more than 8 gigawatts in 2015 and again in 2016. 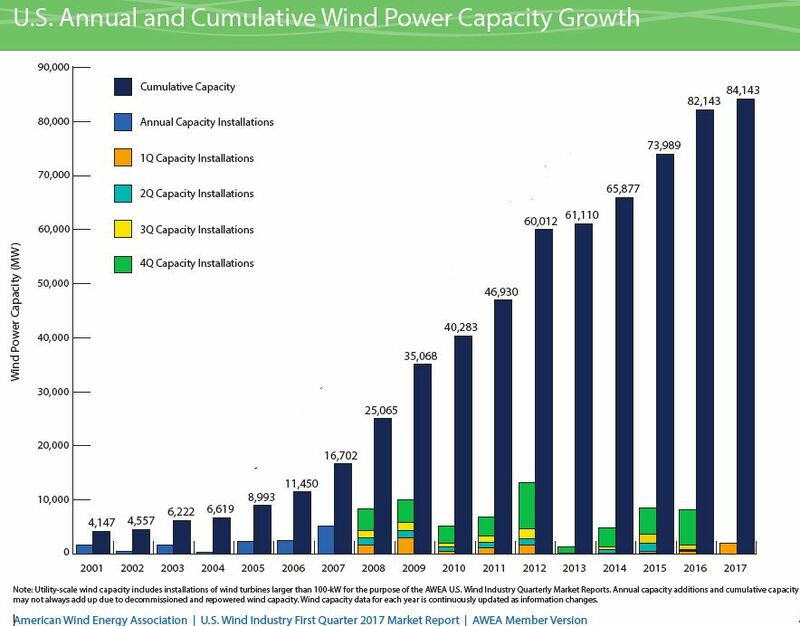 Follow that with the strongest first quarter this decade and the industry can lay claim to some consistency, according to the just-released first-quarter report from the American Wind Energy Association. This promise of market stability follows a decade of up and down deployments, buffeted by policymakers' changing sentiments. Hannah Hunt, a senior analyst at AWEA, called these recent results "a mark of stability after the passage of the Production Tax Credit" that gives "the wind industry a sense of certainty and ability to engage in long-term planning while strengthening domestic supply chains. That's going to help lower the overall cost of wind energy." Hunt noted, "The first quarter of 2017 was the strongest first quarter of installations that we've seen since 2009. We had 2,000 megawatts of installed capacity, leading us to over 84 gigawatts of installed capacity today." "We are entering an era of stability, and we're seeing a strong future pipeline of future project development," she added. Hunt said, "We've seen a steady and significant cost decline system making wind energy more economic than ever." The cost decline is due to technology innovation such as increased blade length and hub height, improved siting techniques, and advanced software that's helping to boost overall performance in the turbine. She notes, "There's been very compelling studies released by NREL that reveal the increased geographic area that can be developed when you increase hub heights from 80 meters, which is still more or less the industry standard today, up to 100 meters. It really has an exponential effect on the area that can be developed." "We continue to see Texas as the perennial leader for wind project development, with over 21 gigawatts of wind. To put that into perspective for you, if Texas were a country, it would actually be ranked sixth in the world for wind power capacity installed." The U.S. wind industry installed 2,000 megawatts during the first quarter of 2017, a 385 percent increase from the first quarter of 2016 and the second-strongest first quarter on record. The addition of North Carolina’s first utility-scale wind project brings U.S. installed wind power capacity to 84,143 megawatts across 41 states. Project developers reported a combined 20,977 megawatts of wind capacity under construction or in advanced development, with 4,466 megawatts in combined new announcements. There are now 9,025 megawatts under construction and 11,952 megawatts in advanced development. 1,781 megawatts of power-purchase agreements were signed during the first quarter, the strongest first quarter for PPA announcements since the beginning of 2013. 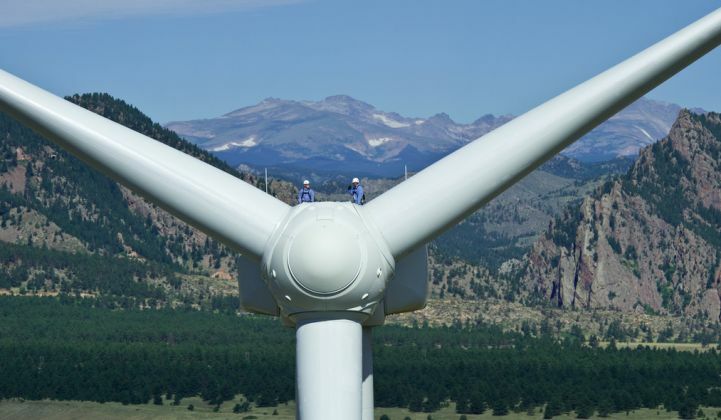 There are now 41 states with utility-scale wind projects. GE Renewable Energy, Siemens and Vestas captured a combined 88 percent of the U.S. wind turbine market during the first quarter. 24 percent of the 2,000 megawatts installed in the first quarter are contracted to non-utility purchasers including the U.S. Army and Google Energy. Hunt noted, "The vast majority of the wind turbines that were installed in 2016 had components manufactured in the U.S. We actually had a major component facility open in Texas, the first time that we've seen a major component facility open in the U.S. in a number of years. That's helping us to reach the 100,000 jobs that [the industry is] supporting today." Crucially, wind is now producing 5.5 percent of U.S. electricity supplies. Hunt said, "What's even more remarkable is that we've seen wind energy be integrated at much higher levels. Really, it's thanks in part to the sophistication of our grid system today. Grid operators for the major grids like ERCOT, SPP and MISO have been able to successfully integrate wind at significant levels without compromising reliability or delivery of electricity to their customers." Yesterday, a number of industry trade groups representing wind, solar and advanced energy asked U.S. Secretary of Energy Rick Perry to “initiate a public process” to gather input to inform the 60-day study he has ordered on electricity markets and reliability. In a letter to Secretary Perry, Advanced Energy Economy, the AWEA, and the Solar Energy Industries Association welcomed the DOE’s examination of today’s electric power system, but stressed that "the growth of wind and solar power neither accounts for the challenges now facing coal-fired and nuclear power plants in the nation’s electricity markets nor represents any threat to reliable electric power."